Patched floral patterns are always popular and stylish. 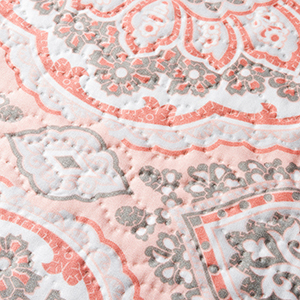 Delicate piped edges make the quilt stylish and durable, creating a neatly tailored appearance. 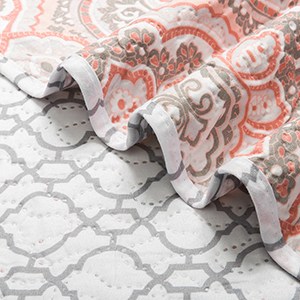 A beautiful tailored look enhances the coverlet to give it an elegant finish. Sophisticated Design adds a touch of polished charm to your bedroom with this quilt and sham set, which showcases elegant, embossed stitch details. Our sheets are made to help you sleep better at night. Our products keep you cool in the summer and warm in the winter. Our extra-fine yarns used in our sheets give them an unusually soft and satiny feel and finish. This quilt is very soft, light and comfortable, and can be used while watching TV, reading a book, or any time you want cozy comfort. 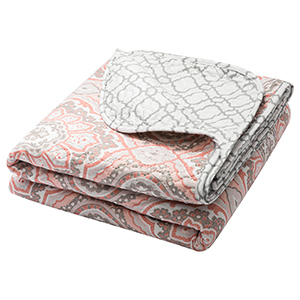 Made by high-level printing and dyeing, the patterns of bedspread quilt are beautiful and have good color fastness. Known for its lightweight warmth and comfort, microfiber is durable, water repellent, wrinkle resistant, machine washable, breathable, and an exceptional value. 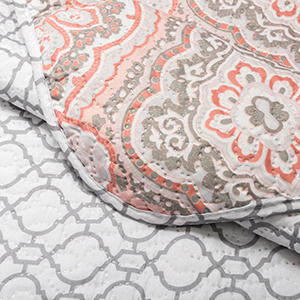 Due to the delicate nature of this quilt, we recommend to wash separately. Machine wash gentle cycle in cold water. Use half the amount of detergent that you use in a regular load. Line dry.